Ronald Bautista, an urban policy analyst and transportation advocate who will be discussing the future of mass transit in Staten Island. 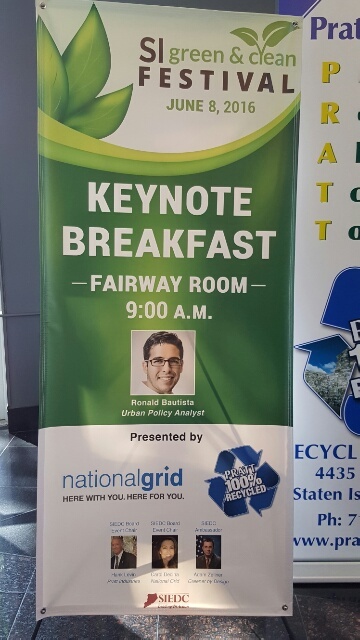 Mr. Bautista’s discussion on “Smart Mobility for Sustainable Economic Development” focuses on Staten Island’s present economic boom and the golden opportunity to implement transit-oriented development decisions that are sustainable over time. Mr. Bautista has lived in Hoboken, New Jersey for the past 16 years and has seen first-hand just how important smart transit planning can be as it related to economic development. Perhaps most importantly, he understands how vital mass transit options can be for Staten Island and how they connect so closely to the development past and future of Hudson County, New Jersey. Mr. Bautista was heavily involved in the Citizens for Hoboken movement which promoted mass transit equity for the city in the face of PATH budget cuts and service reductions. He also serves as a Board Member for the Hoboken Public Library Foundation and is an active member of the New Leaders Council of New Jersey. Most recently, Ronald was a Speaker at the UN-Habitat conference during the Smart City Expo in Montréal. His purpose is to work for people-friendly cities and stronger communities that have a voice and make an impact.